The radial head is part of the radius, one of the two bones of the forearm. The radial head is the name given to the end of the radius that articulates (moves against) with the distal humerus; it helps form the elbow joint. The radial head articulates with the portion of the distal humerus called the capitellum. The surface of the capitellum is convex, meaning that it is rounded like the surface of a ball. The radial head is concave, or slightly dished to form a shallow socket that fits snugly against the capitellum. Like nearly all joints, both are covered with articular cartilage (a slippery covering that allows bone to move against bone). The edge of the radial head also articulates with the ulna, the other bone that makes up the forearm. 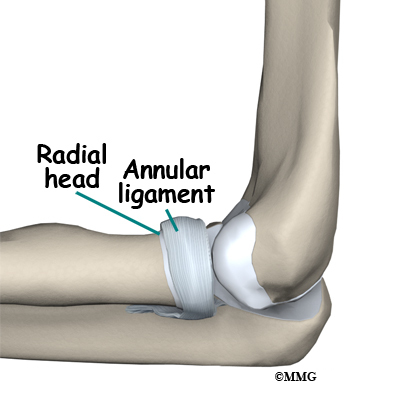 A ligament called the annular ligament circles the radial head and holds it in place. 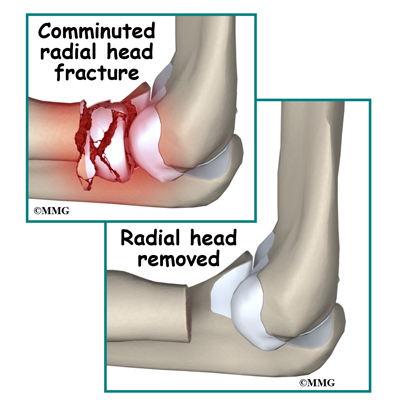 A radial head fracture is usually caused by a fall on the outstretched hand. The force is transferred from the hand through the forearm to the elbow. There is immediate pain on the outside of the elbow. There is usually bleeding from the fracture into the elbow joint causing swelling around the elbow. You will probably not be able to completely straighten the elbow or rotate the forearm. This motion is called pronation (palm down) and supination (palm up). The primary goal of the clinical evaluation of a radial head fracture is to decide whether the fracture fragments are separated to the point that they will interfere with the function of the elbow joint. The fracture is evaluated by taking several x-rays of the elbow. In some special cases where surgery is anticipated, a CAT Scan may be necessary to identify all the fragments and plan the surgical procedure. Your surgeon may also place a needle into the elbow joint and remove the blood that has caused swelling of the joint. The tight swelling increases the pain after the fracture and removing the blood can reduce the pain. After removing the blood, the surgeon may also inject a local anesthetic (such as lidocaine) into the joint to reduce the pain and allow a better evaluation of the function of the elbow joint. The surgeon will be looking to see if the fracture fragments are displaced (out of alignment) enough to get in the way of elbow motion once the fracture has healed without surgery. Finally, your surgeon will examine the wrist. Because most radial head fractures occur after a fall on the outstretched hand, the ligaments of the wrist may be injured at the same time. A wrist injury combined with a radial head fracture is a more serious injury and will influence the decision about whether surgery is necessary or not. Many radial head fractures are simple cracks that do not displace and do not require surgery. The more fragments, and the more displaced the fragments are, the more likely some type of surgery will be required because the fracture fragments get in the way of the motion of the elbow joint. 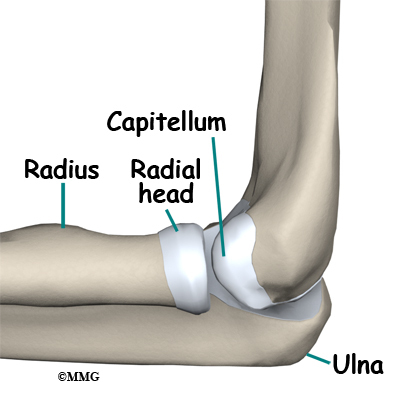 There is not a great deal of force transferred across the part of the elbow joint between the radial head and the capitellum. Most of the force is transferred from the ulna to the distal humerus as we use our arm and hand. This means that even though the radial head is part of the joint surface, it does not need to be repaired as exact as the articular surface of a weight-bearing, or force-bearing joint. 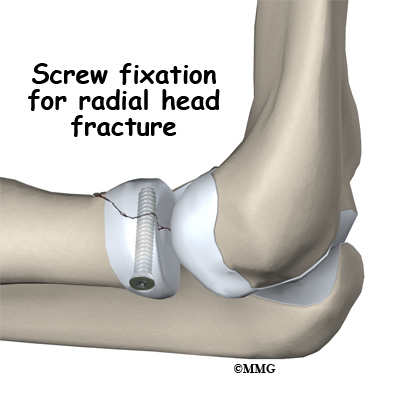 Radial head fractures can be treated without surgery if the fragments are minimally displaced, meaning that the fragments remain in close connection and do not block movement of the elbow. If your surgeon decides that the fracture can be treated without surgery, a splint is usually applied for the first 1one or two weeks. Unlike a cast, a soft, bulky splint allows for changes in the amount of swelling over the first few days or weeks. If your surgeon thinks that the fracture pattern is stable, meaning that there is little chance that the fragments will move, you may be allowed to begin using the arm within a few days. 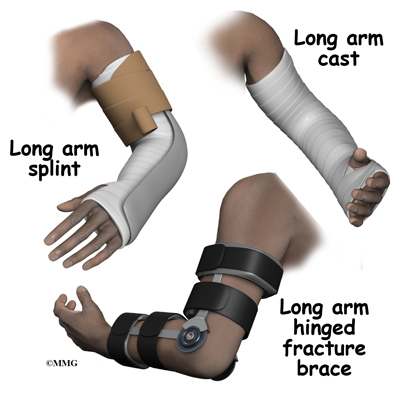 After the swelling has subsided, a long arm cast or fracture brace is usually recommended. The cast or fracture brace will remain in place until the fracture shows signs of healing. This usually occurs at six or eight weeks. Surgical treatment of radial head fractures usually involves making an incision over the lateral (outside) portion of the elbow, putting the fracture fragments back in their normal position, and holding them there with some type of fixation. The fracture fragments are generally very small and the most common type of fixation are small metal pins or metal screws to hold the fragments together. This type of surgery is called an Open Reduction and Internal Fixation (ORIF). If there are multiple fracture fragments that the surgeon decides cannot be reassembled and held together with any hope of success, a radial head excision may be recommended. In this procedure, the surgeon simply removes all the fracture fragments and cuts the end of the radius off to a flat surface. This leaves a gap between the end of the radius and the capitellum that fills with scar tissue. This type of procedure is possible because there is not much force transferred through the joint between the radial head and the capitellum as we use our arm. 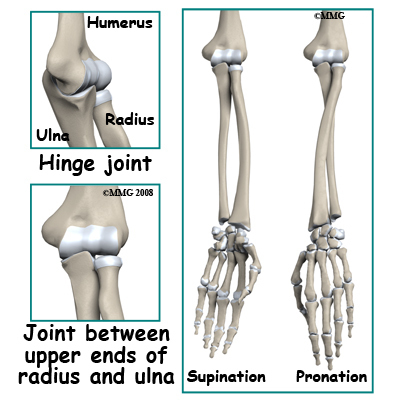 It is more important that the end of the radius is stable against the ulna as we turn our forearm in pronation and supination. In some complex injuries that include a radial head fracture and ligament injuries to the wrist, removing the radial head may not be acceptable. The gap left when the radial head is removed makes the situation more unstable. The small amount of force transferred across the joint between the radial head and the capitellum must be restored to help support the weakened ligaments. 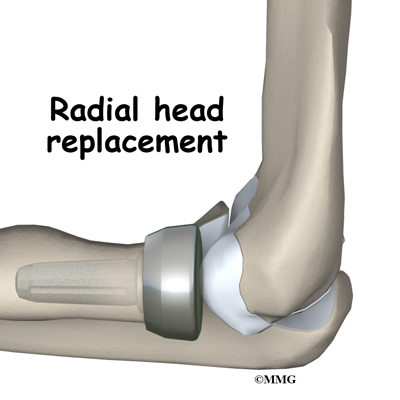 In this case, after the fracture fragments are removed, an artificial radial head is attached to the end of the radius and fills the gap. Nearly all fractures can result in damage to nerves and blood vessels, but damage to these structures is rare after a radial head fracture. The fracture fragments may fail to heal; this is referred to as a nonunion. The fracture fragments may also heal in an unacceptable alignment; this is called malunion. If either of these complications occur, the result may be pain, loss of strength, and a decreased range of motion of the elbow. A second operation may be needed to treat the complication. Because the radial head makes up part of the elbow joint surface, a fracture of the radial head may damage the articular cartilage surface. This may lead to osteoarthritis (wear-and-tear arthritis) of the elbow joint months or years after the fracture has healed. You will always have some risk of developing osteoarthritis after a radial head fracture because of the damage to the articular surface caused by the fracture. Osteoarthritis of the elbow may result in pain and stiffness of the elbow joint and may require additional treatment or surgery if the symptoms are severe. The prognosis for simple radial head fractures is generally excellent. The more comminuted radial head fractures and those that involve other injuries to the ligaments of the wrist and elbow are more likely to result in longer healing time and may require more extensive physical therapy to regain elbow motion. If treatment requires prolonged immobilization of the elbow, your shoulder may become somewhat stiff because you will not be using the joint normally. Physical therapy is usually recommended to regain both strength and range of motion in the shoulder and elbow.